Our family purchased a Bar Crusher 610C (now 615C), a year ago now, and it’s the best lifestyle choice (toy) we’ve made. Based in Perth, the water plays a large part in our lives from and now with the Bar Crusher things are a whole lot more comfortable. We needed a boat which was a good all-rounder, a boat manoeuvrable enough to do family cruises down the river, wakeboard and ski behind, but also strong and stable to give a good ride in some of Perth’s rough seas for serious fishing. We drag our Bar Crusher to the freshwater Waroona Dam south of Perth for skiing weekends and also 1500km north to Shark Bay and Exmouth chasing the big fish. In all circumstances it is responsive and performs well. We can drag it across the country and launch it almost anywhere, from the sand dunes of Shark Bay to the muddy banks of Waroona Dam. 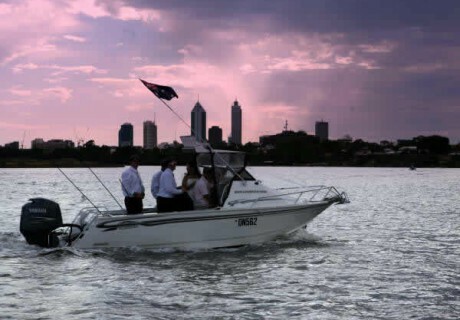 We even used it for our wedding boat, transporting a wedding party comfortably down the Swan River. I have no hesitation in recommending a Bar Crusher to anyone looking for a safe, stable and comfortable boat, which can handle a huge range of conditions. It has outperformed any of our previous boats and other boats trialled before purchasing the Bar Crusher. The design of these boats produces a performance that amazes anyone who is dubious of how well an aluminium boat can handle, it really does ride like a fibreglass boat. Thank you Bar Crusher for making a boat that has met my expectations and lifestyle so well.